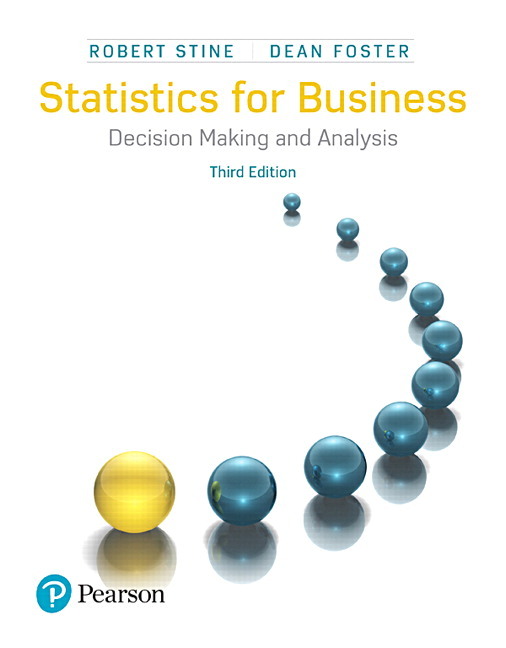 The 3rd Edition of Statistics for Business: Decision Making and Analysis emphasizes an application-based approach, in which students learn how to work with data to make decisions. In this contemporary presentation of business statistics, students learn how to approach business decisions through a 4M Analytics decision making strategy–motivation, method, mechanics and message–to better understand how a business context motivates the statistical process and how the results inform a course of action. Each chapter includes hints on using Excel, Minitab Express, and JMP for calculations, pointing the student in the right direction to get started with analysis of data. Students, if interested in purchasing this title with MyLab Statistics, ask your instructor for the correct package ISBN and Course ID. Instructors, contact your Pearson representative for more information. Each chapter opens with a motivating business example that frames a question and motivates the contents of the chapter. The authors return to the example throughout the chapter, as the statistical methods are presented and provides answers to the question posed in the opening example. 4-M Analytics Examples (Motivation, Method, Mechanics, Message) provide a consistent methodology used for worked-out examples. This approach gives students a consistent structure for solving problems and presenting their findings in the appropriate context. Each chapter includes software hints on using Excel, Minitab, and JMP for calculations and to generate graphs. These hints give students a jumping off point for getting started doing statistical analysis with software. 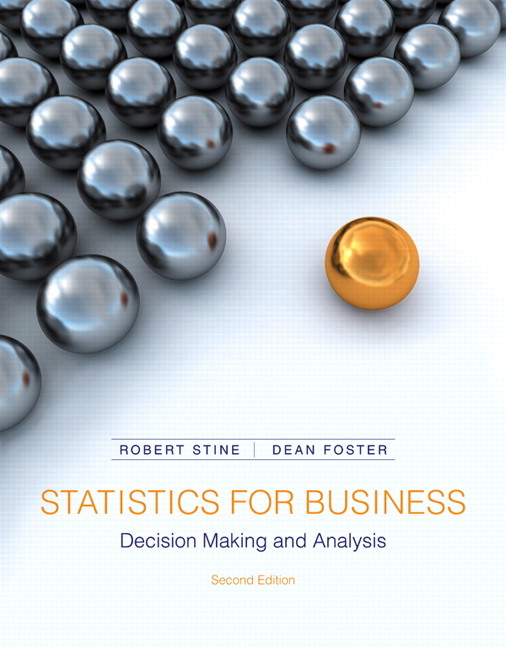 Statistics in Action case studies follow each of the four parts of the book. Each case provides an in-depth look at a business application of statistics, uses real data, and takes students through the details of using that data to address a business question. Each chapter contains a variety of exercises at escalating levels of difficulty in order to give students a full complement of practice in problem solving using the skills they’ve learned in the chapter. Matching and True/False exercises test students’ ability to recognize the basic mathematical symbols and terminology they have learned in the chapter. Think About It exercises encourage students to pull together concepts from the chapter to solve conceptual problems, with no technology required. You Do It problems provide practice working through the mechanics of solving a problem (statistical software usage is recommended). These exercises apply the statistical concepts students have learned in the chapter to data related to a business application. 4-M Analytics Questions are richer, more substantive problems that mimic real applications of statistics in business. What Do You Think? questions check students’ comprehension of the important ideas in the preceding section, ensuring that they understand the concepts before moving on in the chapter. Caution icons indicate a concept that can be troublesome, helping students avoid making common mistakes. Tip icons highlight important ideas or hints within the exposition so that readers don’t overlook them. Best Practices and Pitfalls listed at the end of every chapter offer tips for applying the chapter’s concepts and reminders to help students avoid mistakes, such as using the wrong method for a situation, or misinterpreting results. NEW! Business analytics relies on linking the data to business decisions. This edition adds emphasis, examples, and illustrations that stress the importance of these connections, taking the 4M paradigm further by explicitly linking to analytics. UPDATED! Up-to-date applications explore problems related to “big data” and introduce hot topics, such as A/B testing, that are popular in today’s businesses. Although the methods behind these new topics are familiar within statistics, the names are new. The text ensures that students know the new names, enabling them to link what they learn in the classroom to what they read online. NEW and UPDATED! 90 new and updated data sets are included. The changed data range from examples used within chapters to those underlying exercises. Important, highly visible changes include “through the cycle” finance and economic time series that span the 2008 recession. ENHANCED! More than 100 enhanced exercises remove ambiguities and capture nuances in revised data. Problems that were worded in a way that might confuse students have been clarified. NEW! A new section in every chapter describes, step-by-step, how to complete analytic exercises with the latest version of Excel. Excel is the most popular software for introductory statistics, but some prefer the features offered by statistics packages such as Minitab or JMP, so the text also retains and updates hints for these. Additional tips throughout the text help readers recognize important points that might be overlooked. Clarified explanations, analogies, and examples in every chapter encourage students to delve deeper and learn for themselves. MyLab™ Statistics is the leading online tutorial and assessment tool for teaching and learning statistics, built around Pearson’s best-selling content. MyLab Statistics provides engaging experiences and personalized learning for each student to ensure learning happens in any environment. Plus, it offers flexible time-saving course management features and information about student progress to allow instructors to easily manage their classes while remaining in complete control, regardless of course format–traditional, hybrid, lab-based, or online. Videos tie statistics to the real world. StatTalk Videos: Fun-loving statistician Andrew Vickers takes to the streets of Brooklyn, NY, to demonstrate important statistical concepts through interesting stories and real-life events. This series of 24 fun and engaging videos will help students actually understand statistical concepts. Available with an instructor’s user guide and assessment questions. Business Insight Videos: 10 engaging videos show managers at top companies using statistics in their everyday work. Assignable question encourage discussion. 450 exercises in Getting Ready for Statistics cover the developmental math topics students need for the course. These can be assigned as a prerequisite to other assignments, if desired. Almost 1000 exercises in the Conceptual Question Library require students to apply their statistical understanding. StatCrunch™: MyLab Statistics integrates the web-based statistical software, StatCrunch, within the online assessment platform so that students can easily analyze data sets from exercises and the text. In addition, MyLab Statistics includes access to www.statcrunch.com,a vibrant online community where users can access tens of thousands of shared data sets, create and conduct online surveys, perform complex analyses using the powerful statistical software, and generate compelling reports. Tutorial Exercises with Multimedia Learning Aids: The homework and practice exercises in MyLab Statistics align with the exercises in the textbook, and most regenerate algorithmically to give students unlimited opportunity for practice and mastery. Exercises offer immediate helpful feedback, guided solutions, sample problems, animations, videos, statistical software tutorial videos and eText clips for extra help at point-of-use. MyLab Statistics Accessibility: MyLab Statistics is compatible with the JAWS screen reader, and enables multiple-choice, fill-in-the-blank and free-response problem-types to be read, and interacted with via keyboard controls and math notation input. MyLab Statistics also works with screen enlargers, including ZoomText, MAGic®, and SuperNova. And all MyLab Statistics videos accompanying texts with copyright 2009 and later have closed captioning. More information on this functionality is available at http://mystatlab.com/accessibility. Support students as they learn to use statistical software, to save valuable class time and prepare them for their future careers--whatever they may be. NEW! Tech-Specific Video Tutorials are short, topical videos that address how to use varying technologies, including Excel, to do the work. When working any exercise that includes a data set, students can export that data easily in a single click, which minimizes their time doing data entry and keeps their focus on solving the problem. EXPANDED! Tech Assumed Questions in MyLab Statistics: Exercises marked with a "-T" assume the use of technology throughout the exercise and accompanying learning aids. A "Tech Help" button gives access to Technology Tutorial videos for all MyLab Statistics exercises that require it. These videos are appropriate for any software. Software output screens include displays from StatCrunch, Minitab, TI-83/84, and Excel to illustrate exercises and examples where appropriate. Technology Answers are now included where they differ from by-hand computations. Personalized Learning: Not every student learns the same way or at the same rate. With the growing need for acceleration through many courses, it's more important than ever to meet students where they learn. Personalized learning in MyLab Statistics gives you the flexibility to incorporate the approach that best suits of your course and your students. The Study Plan acts as a tutor, providing personalized recommendations for each of your students based on his or her ability to master the learning objectives in your course. This allows students to focus their study time by pinpointing the precise areas they need to review, and allowing them to use customized practice and learning aids–such as videos, eText, tutorials, and more–to get them back on track. Using the report available in the Gradebook, you can then tailor course lectures to prioritize the content where students need the most support–offering you better insight into classroom and individual performance. Business analytics relies on linking the data to business decisions. This edition adds emphasis, examples, and illustrations that stress the importance of these connections, taking the 4M paradigm further by explicitly linking to analytics. Up-to-date applications explore problems related to “big data” and introduce hot topics, such as A/B testing, that are popular in today’s businesses. Although the methods behind these new topics are familiar within statistics, the names are new. The text ensures that students know the new names, enabling them to link what they learn in the classroom to what they read online. 90 new and updated data sets are included. The changed data range from examples used within chapters to those underlying exercises. Important, highly visible changes include “through the cycle” finance and economic time series that span the 2008 recession. More than 100 enhanced exercises remove ambiguities and capture nuances in revised data. Problems that were worded in a way that might confuse students have been clarified. A new section in every chapter describes, step-by-step, how to complete analytic exercises with the latest version of Excel. Excel is the most popular software for introductory statistics, but some prefer the features offered by statistics packages such as Minitab or JMP, so the text also retains and updates hints for these. MyLab™ Statistics is the leading online tutorial and assessment tool for teaching and learning statistics, built around Pearson’s best-selling content.MyLab Statistics provides engaging experiences and personalized learning for each student to ensure learning happens in any environment. Plus, it offers flexible time-saving course management features and information about student progress to allow instructors to easily manage their classes while remaining in complete control, regardless of course format—traditional, hybrid, lab-based, or online. Tech-Specific Video Tutorials are short, topical videos that address how to use varying technologies, including Excel, to do the work. Tech Assumed Questions in MyLab Statistics: Exercises marked with a "-T" assume the use of technology throughout the exercise and accompanying learning aids.